We left the interesting and friendly Banda Islands and headed for Triton Bay on Tuesday 26th of November. It was a lovely sunny morning as it often was during the cruise. One of the lecturers gave an illustrated talk about the area we were approaching. 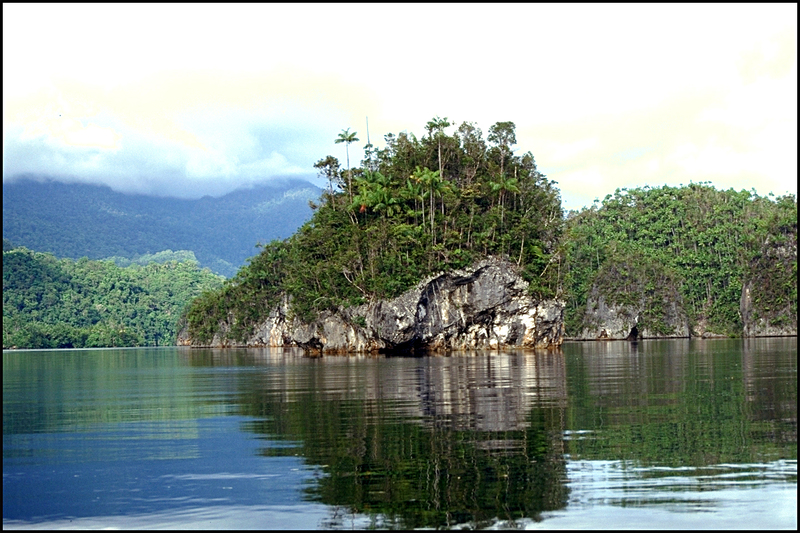 Triton Bay is an unusual scenic group of small mushroom-shaped islands with steep cliffs covered with jungle foliage. 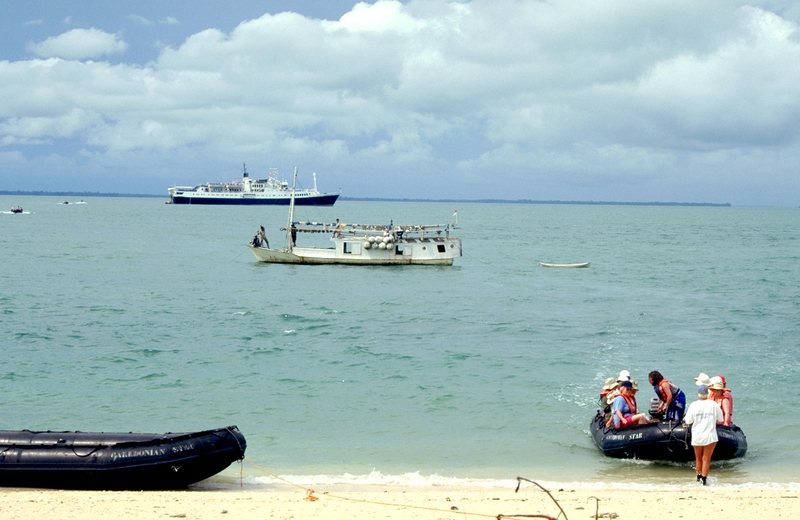 The shallow bay is a haven for birds and fish – birds like Hornbills, Cockatoos and Birds-of-Paradise. 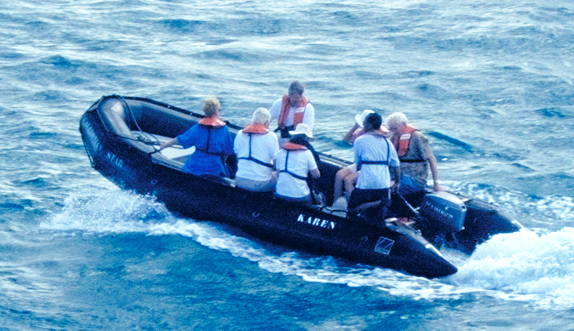 As soon as the Caledonian Star dropped anchor the zodiacs were lowered and off we went – all 120 passengers – to explore these fascinating islands. We set off in convoy but soon lost touch with other boats as we found all kinds of interesting plants and birds to admire on shore. We didn’t actually set foot on land, but there were signs of life. Several times we passed small fishing huts and dug-out canoes. Our ‘driver’ stopped from time to time to give us a chance to just sit there and absorb the jungle sounds and the unusual place it was, without the noise of the engine. I have never been anywhere I felt so relaxed and in awe – it was like entering a different world. Triton Bay lies on the Indonesian side of New Guinea, named Irian Jaya,and it reminded me of the fabulous exploration films we see on TV when the experts go in search of the world’s least visited spots. 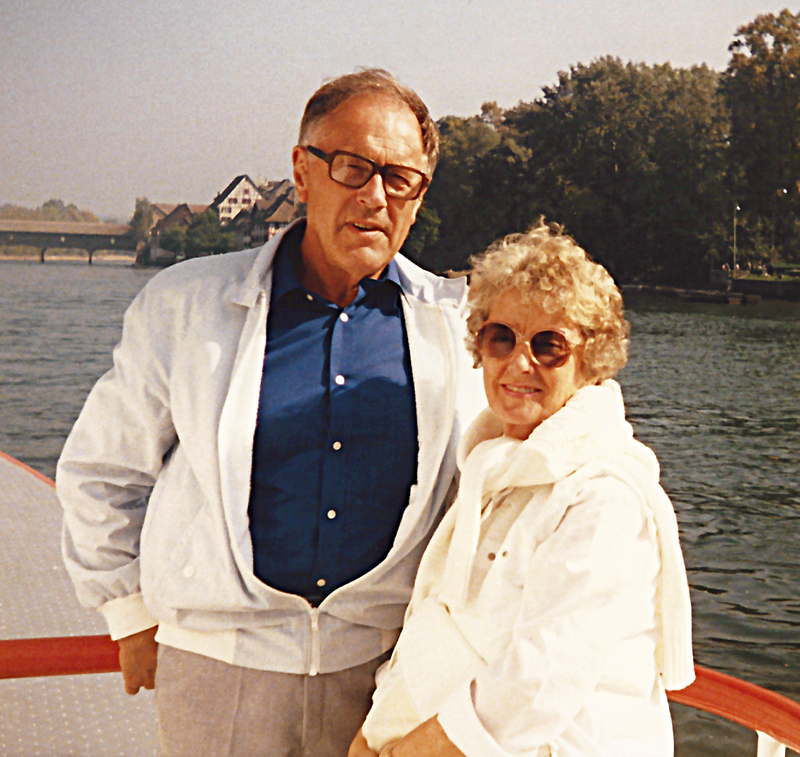 All the passengers were quite excitable that evening as we gathered on deck for a barbecue dinner, and watched the sun set over the ocean. 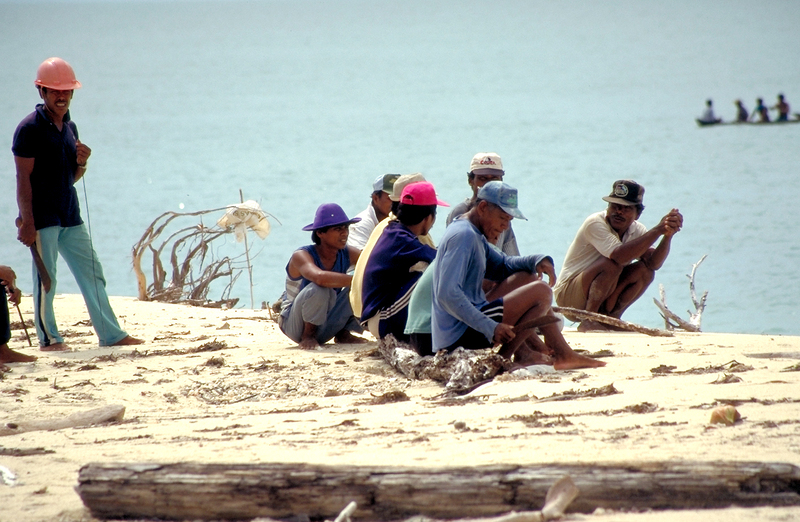 It would have been great to see more native fishermen and people, but that was not to be. It is very humid in this part of the world, but the rain is warm and comes in short, sharp bursts. 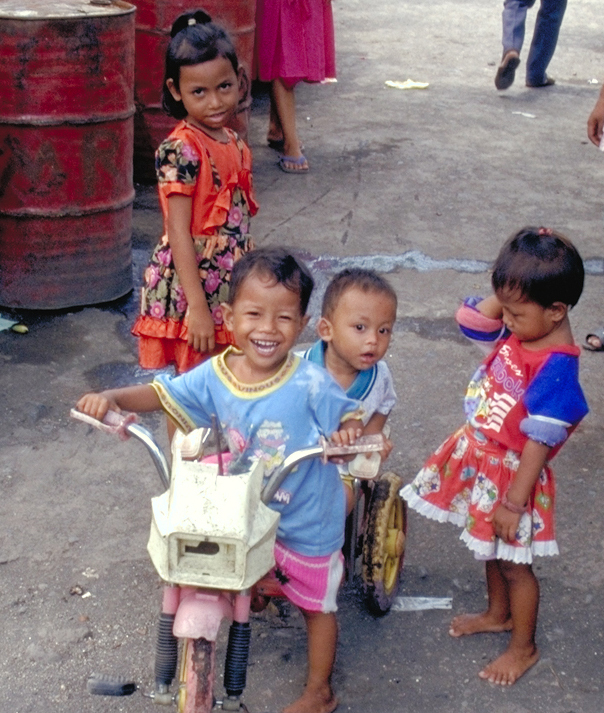 Wednesday 27 November: Our next, and last, stop before leaving Indonesia was an island named Karang. 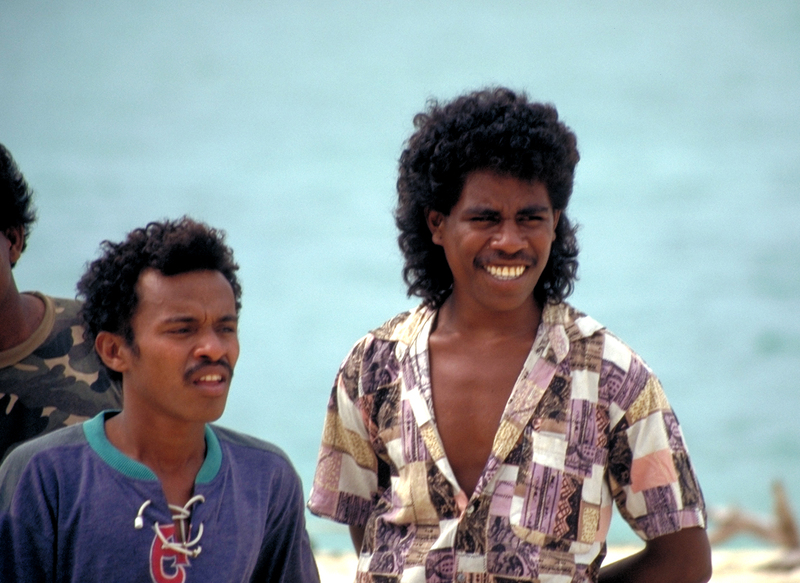 This little uninhabited island lies within the Aru archipelago, and the islands are spread across the sea between Timor and Irian Jaya. We went ashore in the usual zodiacs, watched by fishermen and pearl fishers! It was not expected to find people there, but it was an added bonus I felt, although I thought (we all did really) that the men looked rather hostile. 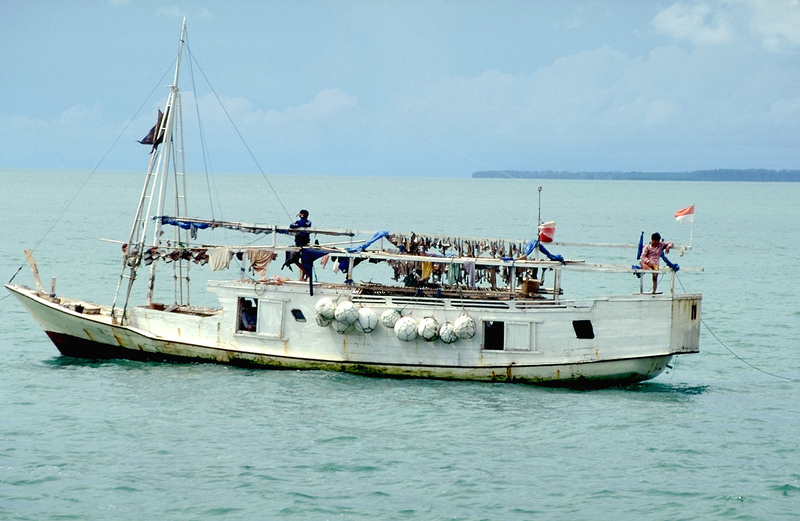 When we came ashore we found there were three boats which had come from Buton, near Sulawesi in order to catch sharks. They remove the fins and tails, which we could see drying onboard their ships. These would then be taken to a trading centre and exported to Hong Kong. Their journey took 10 days and they remained in these waters for a month. It is a journey only undertaken once a year. The little boats didn’t look very sturdy for these, sometimes, wild seas, and they didn’t bring much water or food. A tough life! 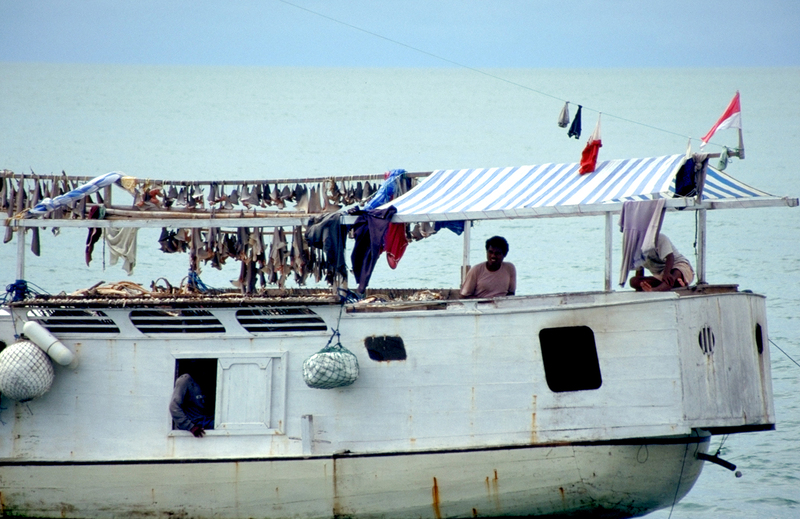 The pearl-divers came from Aru and was part of a fleet of five – the same man owned all the ships. They were fishing for oysters which were brought to a farm for cultivated pearls. It takes about two years for a pearl to grow inside the shell. They normally catch 100 a day. The oysters are kept in wire cages alongside the side of the ship – to prevent the shells from damage. The men seemed to find these ‘odd-looking’ old people from the west peculiar! They kept looking and laughing at us and shaking their heads – as if they wondered why we suddenly appeared. This is a close-up of their rather flimsy boat and the shark fins and tails drying. Sandy beaches everywhere. 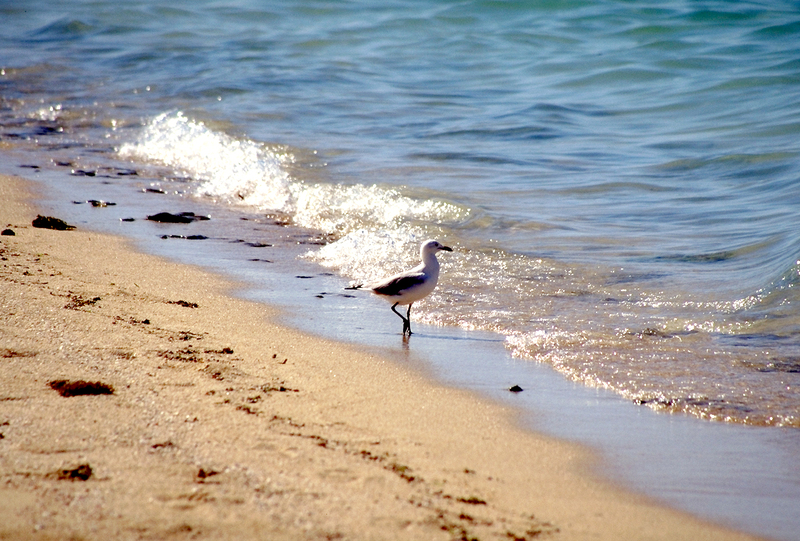 Just perfect to walk barefoot and feel the warm sand under your feet. During the evening there was a cocktail party, hosted by the Captain. A jolly time was had by all. As the sun set we caught a last glimpse of Indonesian islands before heading for the Barrier Reef and Thursday Island. 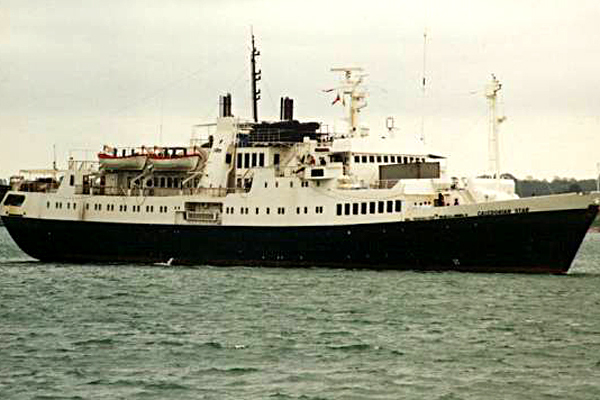 On the 23rd of November 1996 the Caledonian Star dropped anchor off the little Kakabia island. It was time to fit in a cruise around this interesting island, and a fleet of small black zodiac, seating about eight people, began the tour. It was a hot and humid day but the rain stayed away. 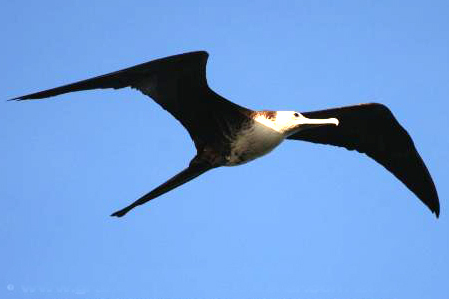 Overhead we saw a frigate bird in all its glory, looking fit and healthy. We felt quite privileged being there and having a knowledgable expert in the boat with us. He knew all about the birds and wildlife in these waters. 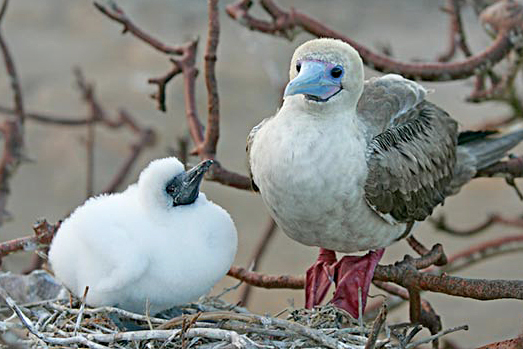 Red-footed boobies were spotted on the island. We went ashore for a rather brief visit before heading back to the ship, lunch and a snorkel session for those interested (I was – and saw lots of brilliant coloured fish). It was a wonderful experience. I am no strong swimmer, but we all wore life vests and simply floated on top of the water admiring the brilliant under-water life we don’t even realise is there. The next day was spent at sea – just relaxing by the little deck-pool, eating and drinking and chatting with newfound friends. Very pleasant indeed. On Monday 25th of November we dropped anchor off the Banda islands, in the Banda sea. 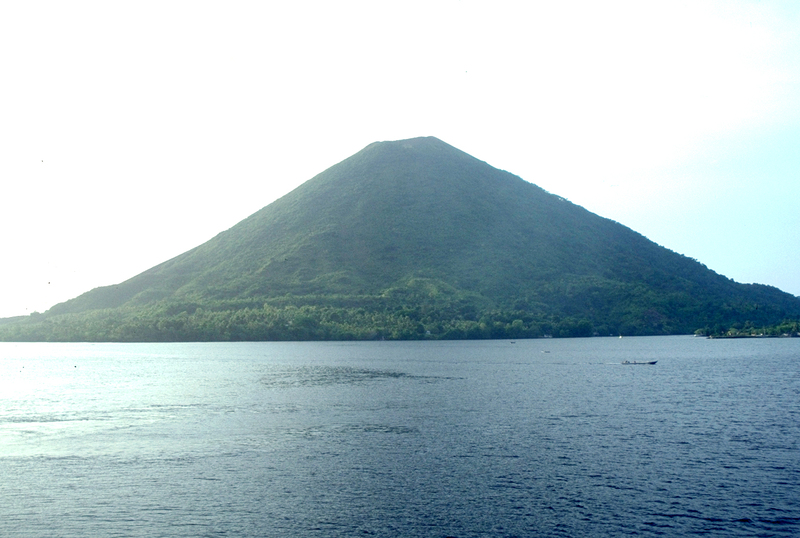 The Gunung Api volcano overshadows Banda and has erupted many times. 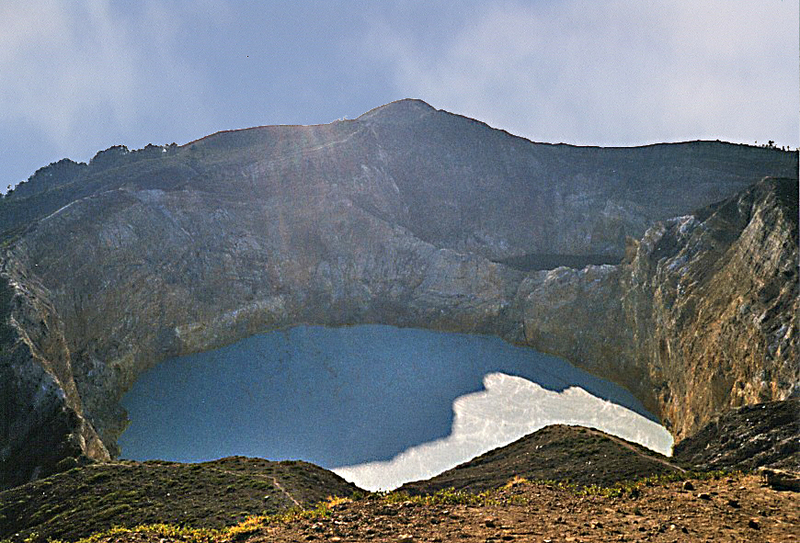 The latest eruption took place in 1988. We all gathered on deck as we approached Bandaneria. This is where the majority of the population live, and the active volcano is only 650 metres away! 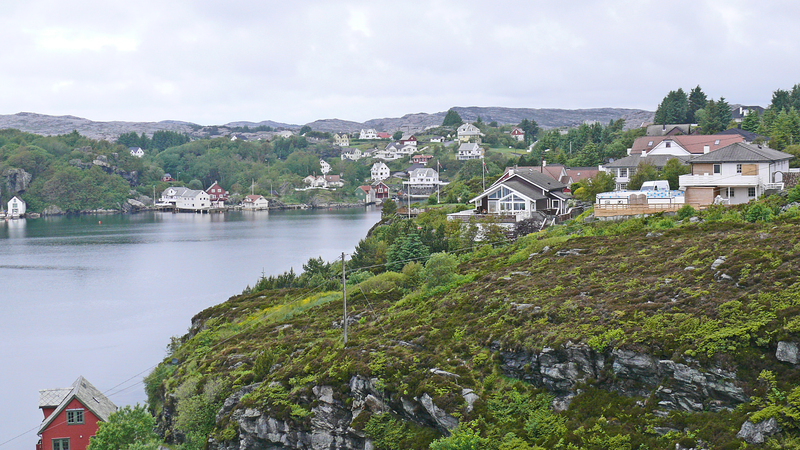 There are ten small attractive island which make up the 60 square km archipelago. The sea here is very deep, more than 6500 meters of ocean water. We felt very honoured indeed as we approached shore and were met by traditional war canoes. They circled our ship several times. It was a wonderful welcome. Theses colourful little boats and singing and happy-looking crew seemed glad to see us. Not many visitors come this far. (I really wonder if that has changed now, all these years later?) Little boys dived from the boats and were so at home it the water I felt quite envious. We went ashore for a guided tour. 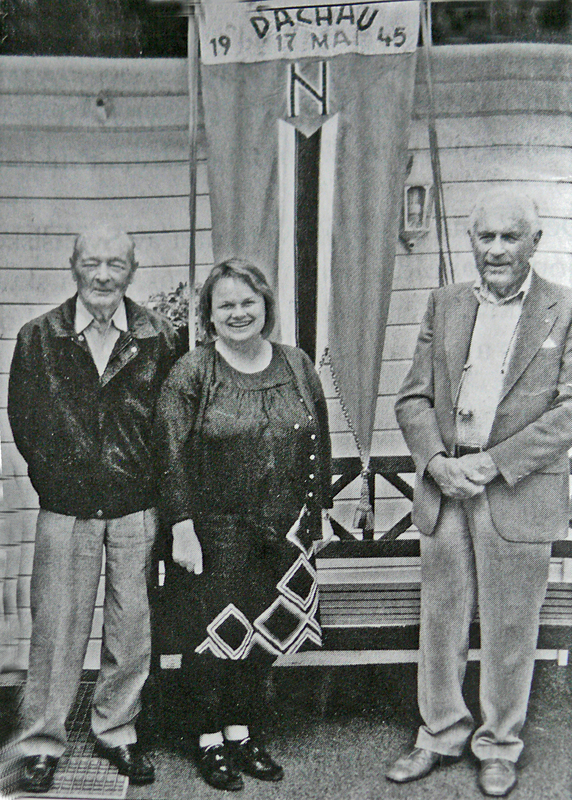 The oldest couple onboard were presented with gifts, consisting of spices grown on the island. A brass band (not very good!) played for us. Their only ‘properly presented’ tune was ‘Onwards Christian Soldiers’.But it was a great experience. 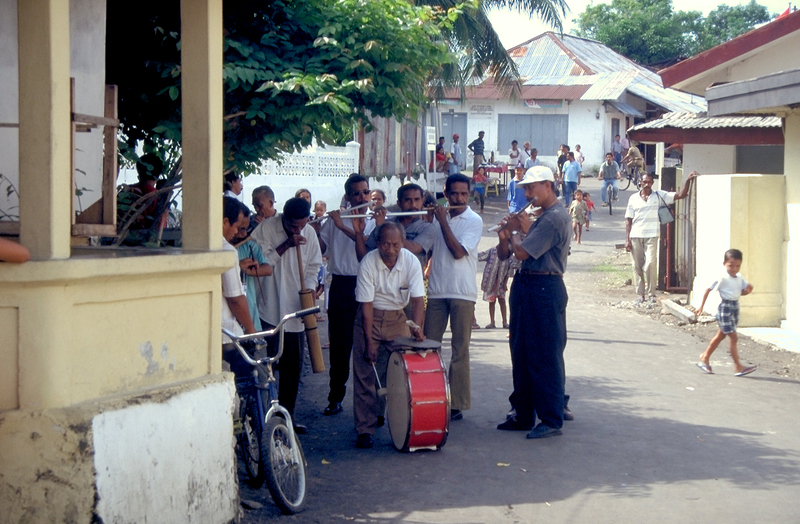 The band followed us around town, and played the same tune over and over again. Ron and I walked around the market and chatted with some of the locals, The children were lovely and eager to be photographed. The parents didn’t mind at least to have their children’s photos taken. The market was scruffy and the fish on sale full of flies, but people looked fit enough. The climate here is hot and humid all the year round. These isolated islands were discovered by the Dutch in 1512 when they went in search of spices. They found an abundance of nutmeg and mace growing there which brought great profits to those who were able to control production and trade. Now a days they hope that tourism and fishing can stop people from leaving. The islands have great potential and will hopefully benefit by increased tourist trade and the excellent fishing and diving facilities. 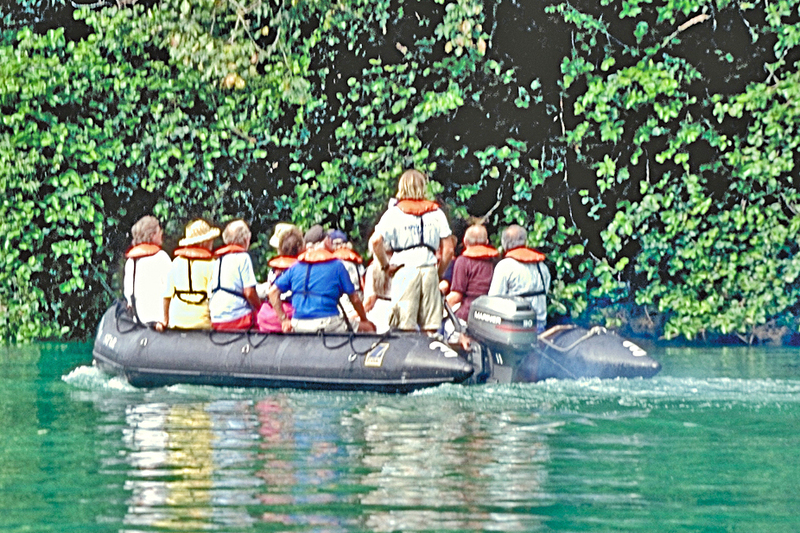 An exotic holiday in 1996 – Bali to Barrier Reef – continued – from Medang to Komodo Island. It was early morning when we dropped anchor near the tiny Medang Island. I don’t think they were used to having many visitors because people flocked onto the beach when we came ashore in the little zodiacs. Young children came swimming towards us, stark naked, and the young girls had their faces pained white with some kind of rice paint. 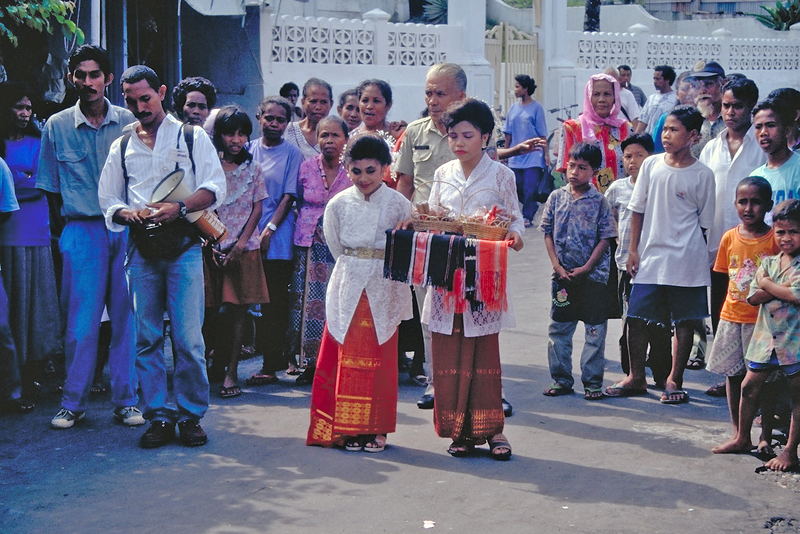 Medang had, at that time, a population of 1300 of mixed origin. These villagers were all muslims. There was a mosque on the island and one school with four teachers. Chickens and goats were the main source of meat, and coconuts were an essential ingredient of their lives. We saw television masts in various places and realised they were not totally isolated. 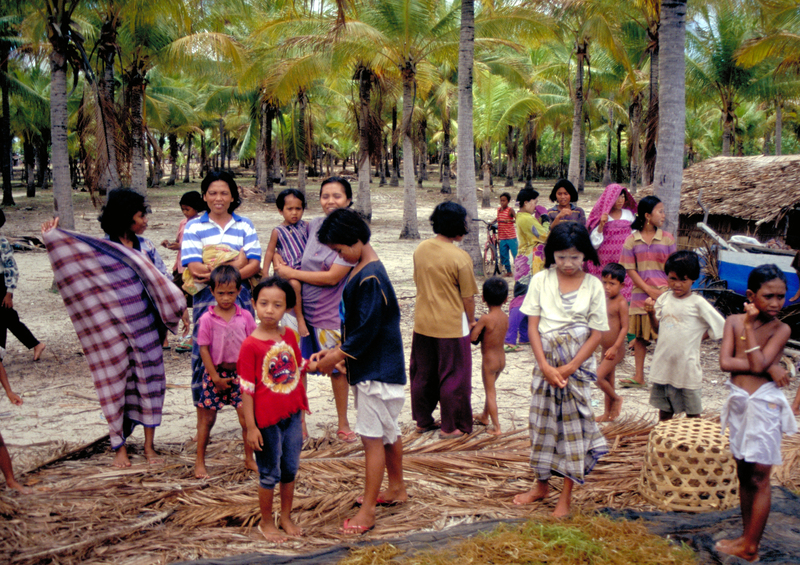 The main activity on the island was the collection of Agar-Agar. This algor algae was collected by boat, brought ashore, dried on the beach and split into piles by colour. It was sold to local traders who again sold to companies producing pharmaceutical gel-caps. I sometimes wonder what it is like there now – I bet many of the children have gone elsewhere and life is very different. 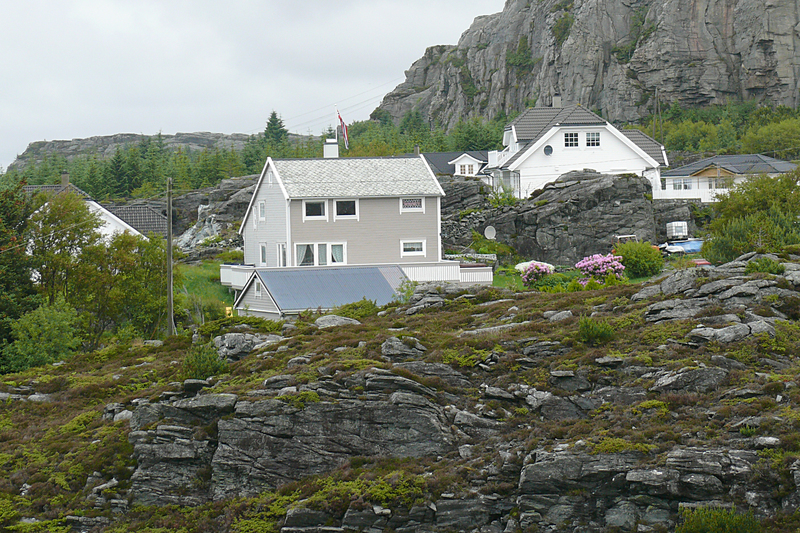 It seemed such a remote island, but the modern world is catching up with everybody these days. For us it was a fascinating stopover, and the children were keen to show the visitors their homes and beach – all white and sandy and pristine. 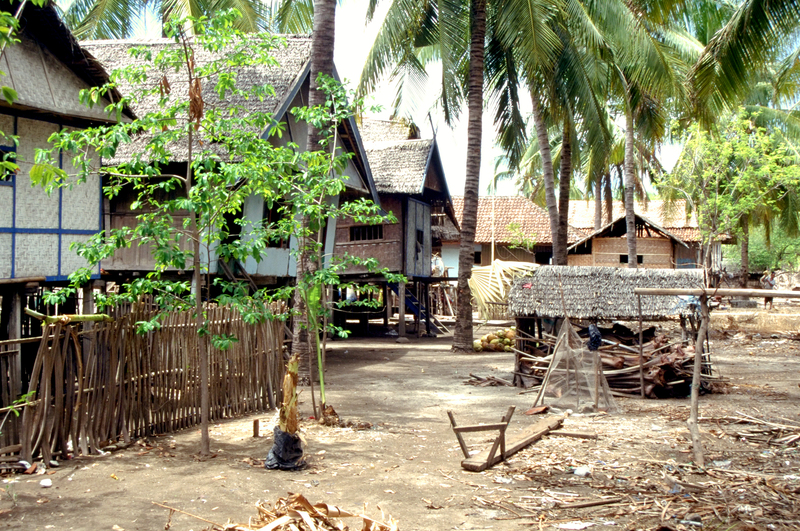 We left Medang and sailed to a nearby island named Satonda. It is un-inhabited and there is a brackish lake there which was formed in 1815 when the nearby Tambora volcano on Sumbawa island exploded. The lake is said to have ‘rejuvinating’ powers, and will take ten years off a person’s age. Well, you can imagine we all wanted to have a go, but were sorely disappointed – we looked just as old after the swim as we did before!! 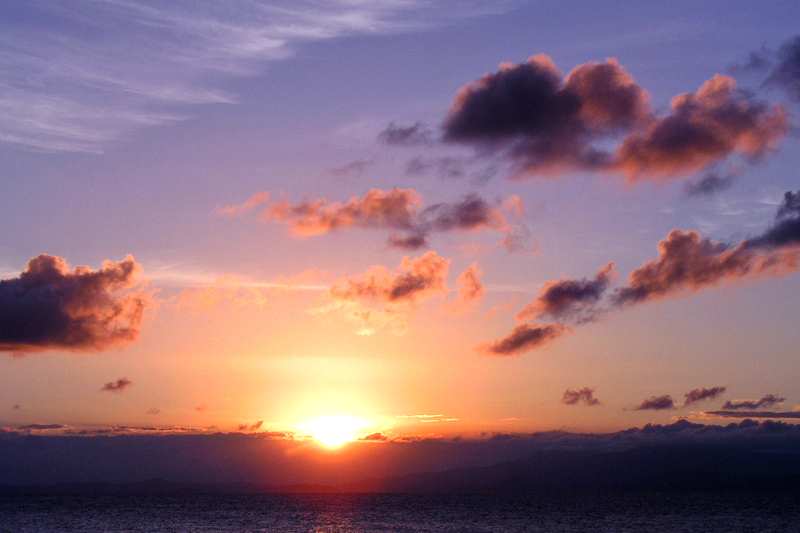 Something rather extraordinarily happened just before the tropical darkness descended . We were anchored near Satonda Island and looked towards land, and saw a large colony of fruit bats (flying foxes) taking off from the island. They have a wing span of 5.6 feet. They roost here during the day and fly across to the nearby Sumbawa island where they feast on the fruit trees. These bats are reddish-brown in colour and are said to be not true bats, but primates that have developed the ability to fly. Their sense of smell and eye sight are well-developed, and they use sonar to navigate and hunt their prey. After a swim or snorkel in the warm blue waters, it was time to meet the captain and crew during the evening’s cocktail party, and a chance to dress up and ‘look pretty’. Friday 22nd of November: This was the main highlight for many of the passengers! 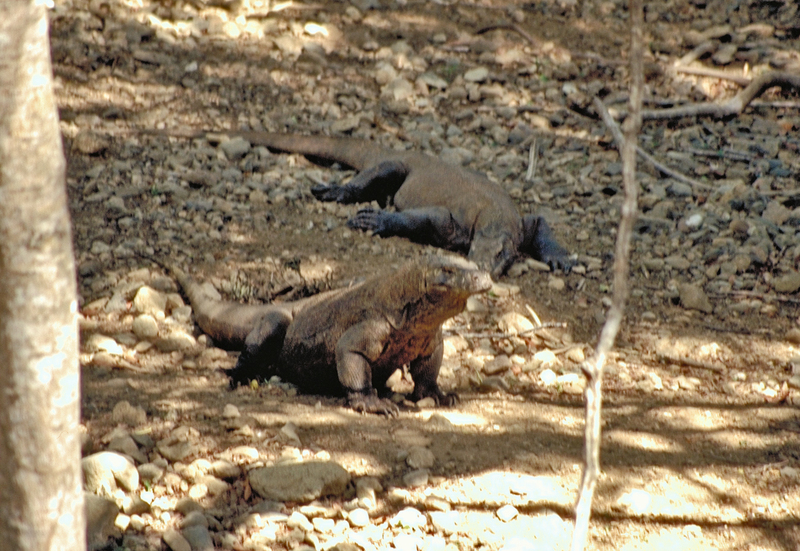 We arrived at Komodo Island – famed for its giant beasts – the Komodo Dragons! This monitor lizard can grow up to eight feet in length, is exceedingly ferocious and will eat anything it can get hold of. 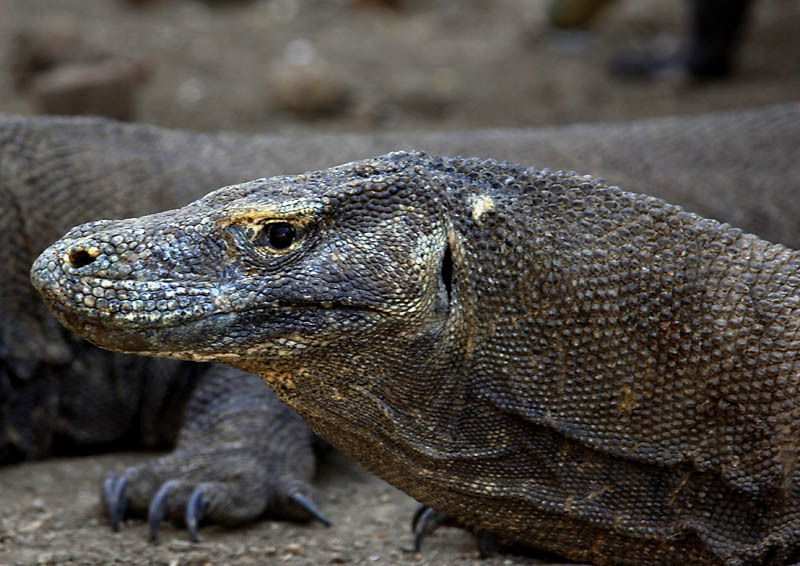 This particular type is found only on Komodo and a near-by island. Their main preys are deer, goats and ground nesting birds. But they are known to eat a straying person or two as well! People live in a few small villages on the island and have to be on the look-out because the Dragons come very close to their houses looking for food – and a small straying child! A native guide came to the ship and led the 45 minute walk to the viewing platform, where we could safely observe the dragons. It was a very hot and humid morning, I remember. We saw interesting birds and nervous-looking deer as we trotted along. Poor things, they come at the top of the dragon’s gourmet menu. What a precarious existence. The viewing platform has been erected for the visiting tourists, and a small lake created in order to attract the Rusa deer, which the dragons prefer to eat. The way it is done is to bite the deer with their bacterial-filled mouth. This will poison the poor creatures and they die a slow and horrible death. That’s when the dragons come to enjoy their dinner! Not a very endearing animal I must say, but it was a fascinating visit. The guide carried a ‘forked tool’ in case a straying dragon came across our path. No-one appeared, fortunately, but we did see the tail end of some as they rested in a hole (lair) under a shady tree. After a delicious lunch onboard some of us went snorkelling in the afternoon. The sea was lovely, warm and blue. It was a great place to see the coral reef and the colourful fish beneath us. Next stop: Kakabia Island. 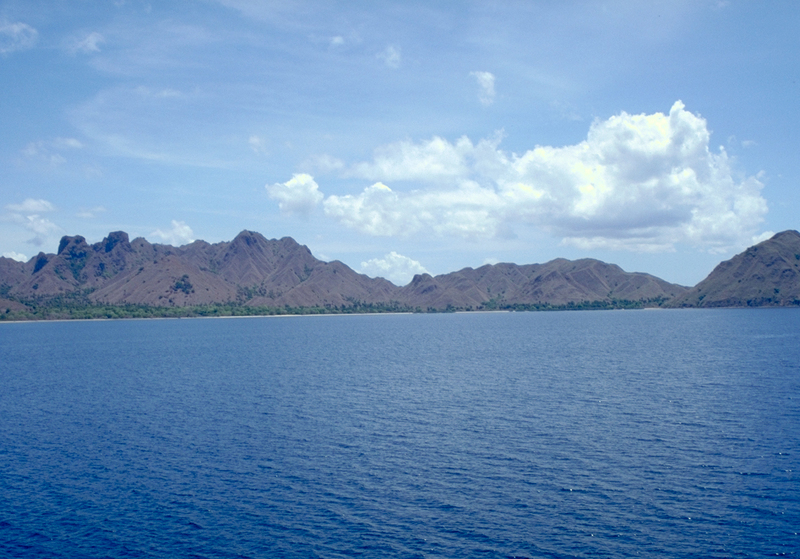 This is Komodo Island as seen from the ship. After all this writing about the Second World War I think it is time I try to produce a more cheerful story. Ron and I made up our minds some years ago that we wanted to ‘see the world’ and visit foreign lands while we could still afford it and were fit and well. After all, seeing new places and meeting people with different customs and outlook would be exciting and beneficial we felt. I always dreamt about tropical countries as a child so this would be ‘a dream come true’ for a lass from Norway. The book that made me want to travel was one called ‘Betty on a Coral Island’ which I read as an eleven year old girl. Fancy that – I still remember, and in my mind I can picture this girl and wanting to experience her adventures. We lost our beloved dog Mac in 1996 and felt sad and upset. So we decided to treat ourselves and have a very expensive and different holiday. The Daily Telegraph had an add in the travel section about a cruise on board a small 120 passenger ship. This cruise originated in Bali and ended up in Cairns, Australia sailing through Indonesia. (It was quite safe at that time). I don’t like the big ‘monster-ship’ they have these days – too big and impersonal for my liking. In late November, when the weather was horrible and wet in England, we flew to Bali from London. Hilton Hotel, in the exclusive resort of Nusa Dua, was our home for three nights. What luxury!! It was so grand and big and warm. Yes, we thought, we like this! 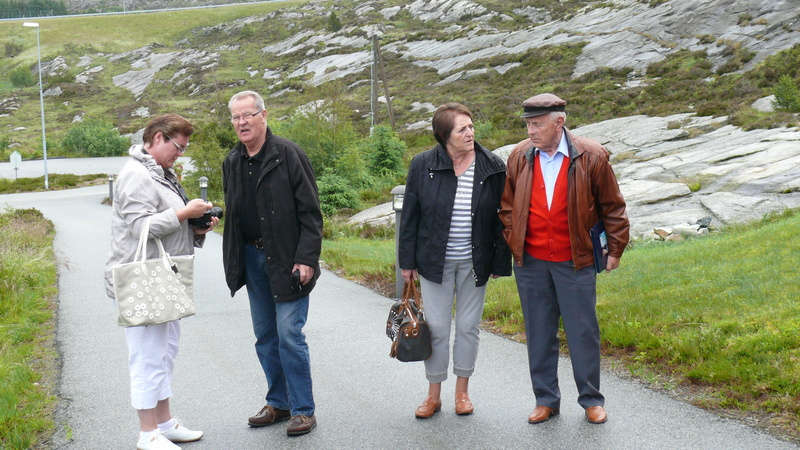 Various trips were arranged from the hotel and we saw as much as possible. We sat under the palm trees and listened to the birdsong and enjoyed a drink or two. 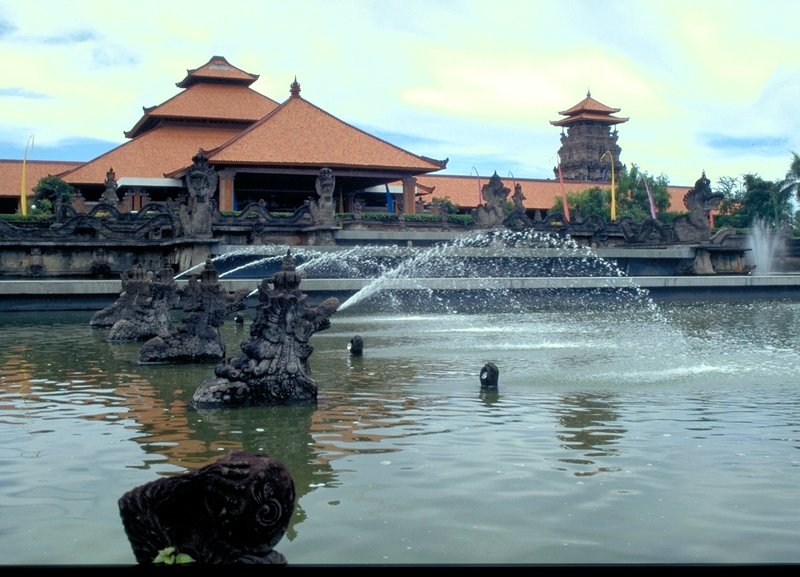 Bali is full of temples and shrines and the people worship many Gods. Everywhere we went people were welcoming and friendly. 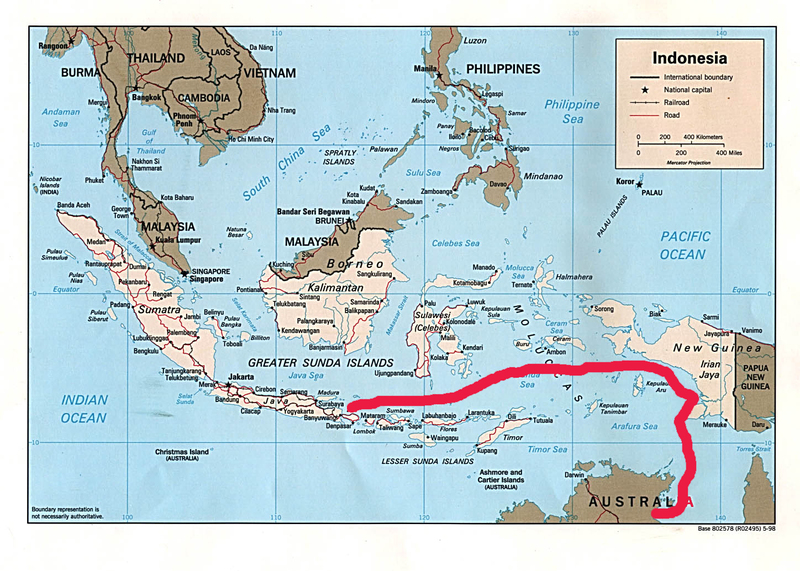 This was our route – sailing through Indonesia and entering the Barrier Reef. On Wednesday the 20th of November, late afternoon, we boarded our ship MS Caledonian Star and were escorted to our little cabin. I must say, this ship was quite old and not as grand as some, but the places we visited made it all worth while. Many of the passengers had come straight from the airport and were tired after the long flight. We were served coffee in the lounge, had the lifeboat drill, and relaxed for the evening. As you know, Indonesia is full of islands, small and large. 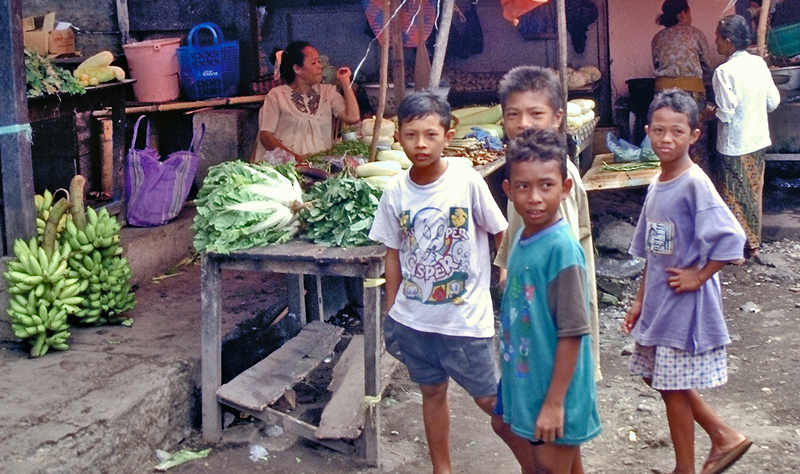 We left Bali and headed for a tiny island called Medang. In the next instalment I will carry on with our various stops! 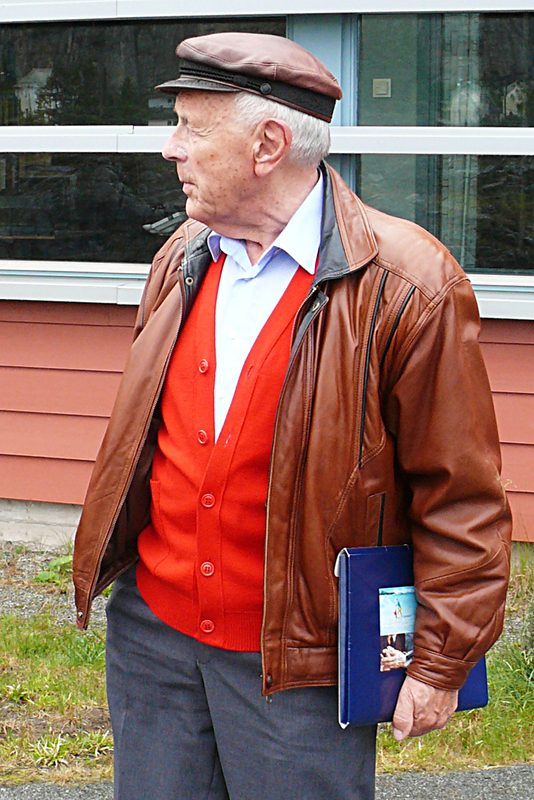 “The sewing room was a busy place”, Torbjoern said. 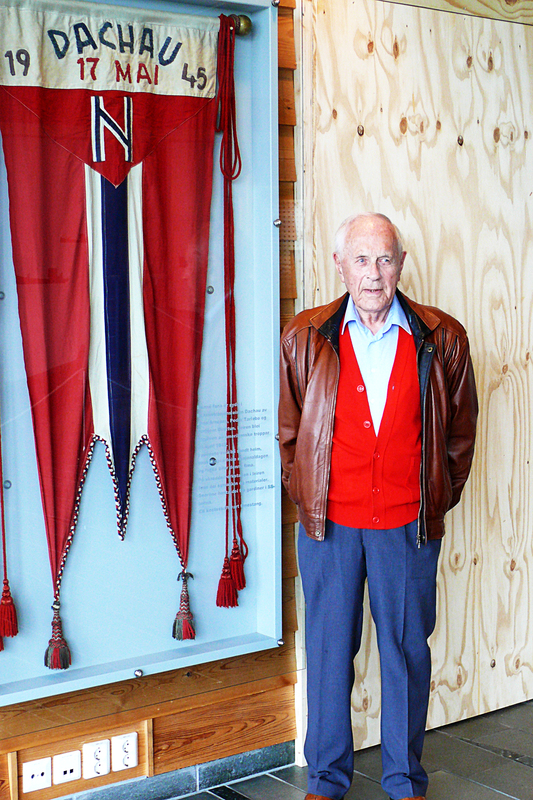 He and his friend, Arne, were occupied designing and making a banner in readiness for the May 17 celebrations. 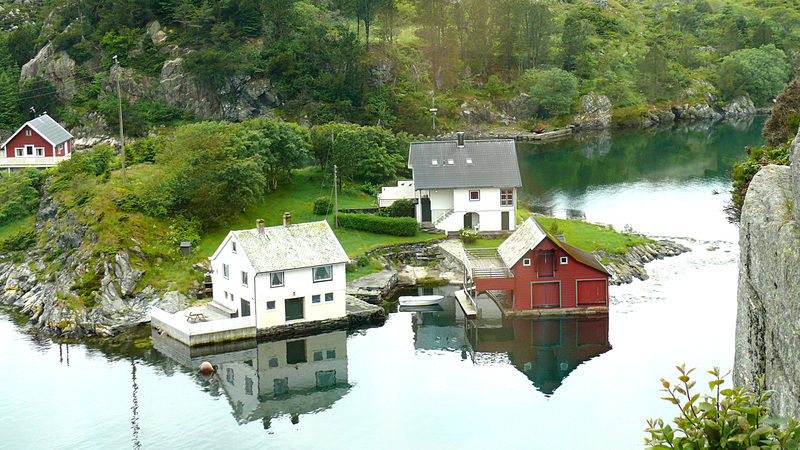 This is Norway’s Constitution Day, and proud Norwegians everywhere want to participate. 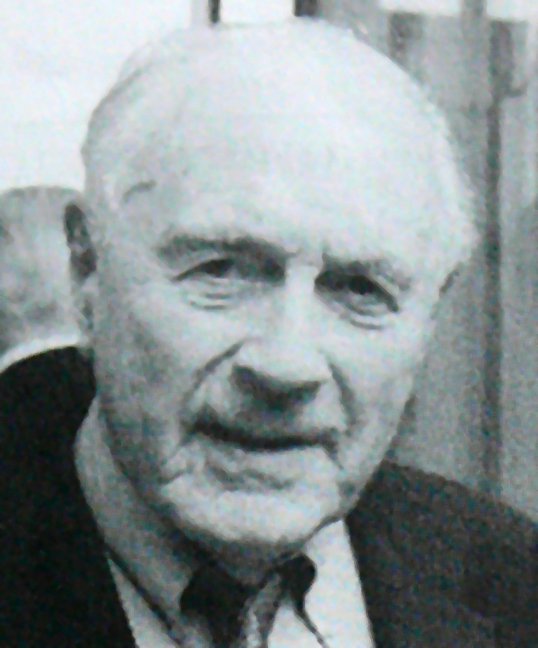 For these men, so long imprisoned and starved, it was of particular significance. 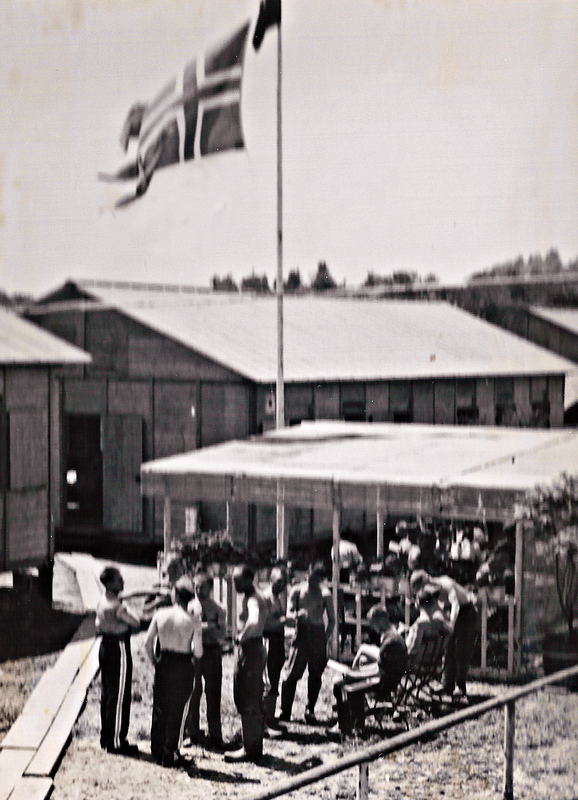 Their living quarters had improved greatly since they were relocated to the SS-guards barrack. 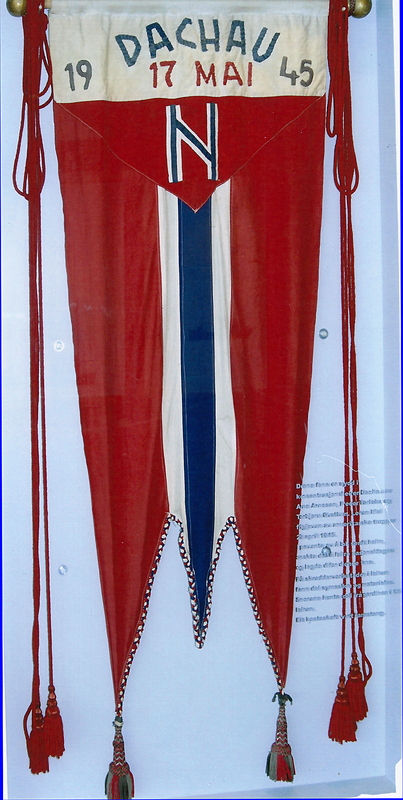 They found uniforms which had belonged to Norwegian army personnel while looking for material, and set to and stitched and fixed these garments and made them fit the skinny mens bodies. Most of them weighed between 36-40 kg at that time. This is the banner they made. 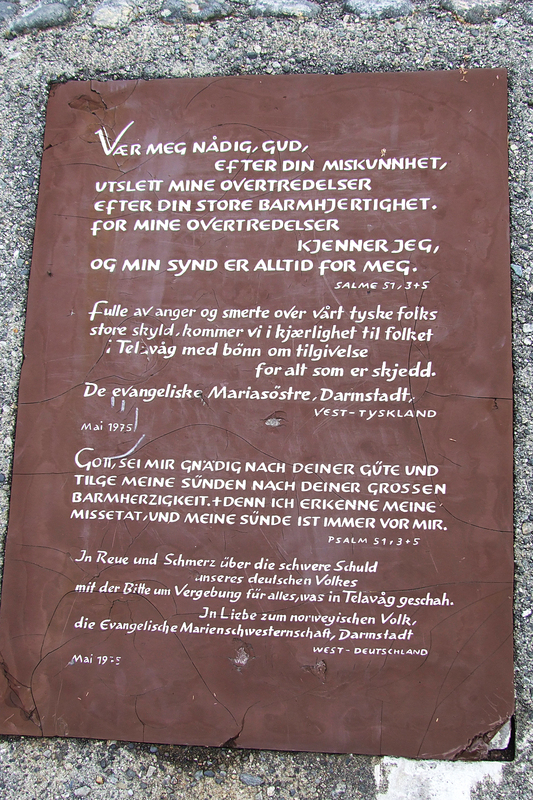 It is now on display at a war museum in Telavåg – a small community near Bergen which was destroyed by the Germans during the war. So it was that 78 happy but thin Norwegians marched onto the parade ground in uniforms and wearing rosettes in red, white and blue on their lapels. 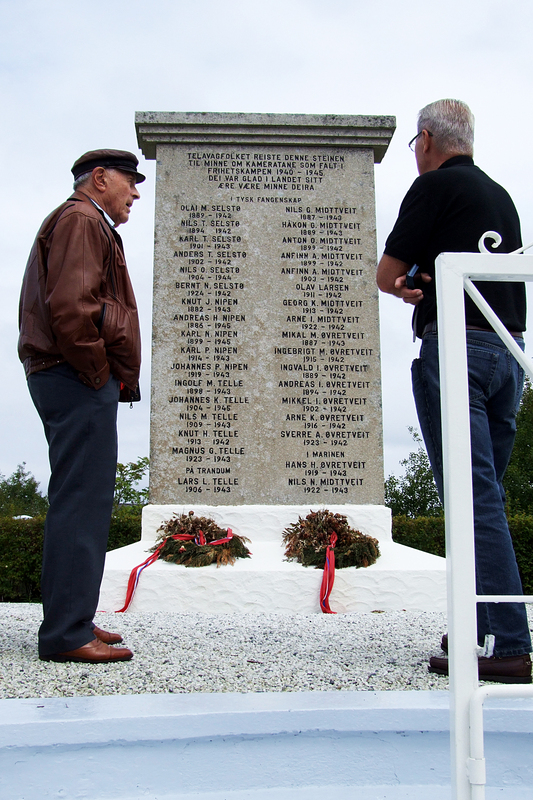 The Norwegian/American officer in charge gave a moving speech, and it was a day no-one would ever forget. 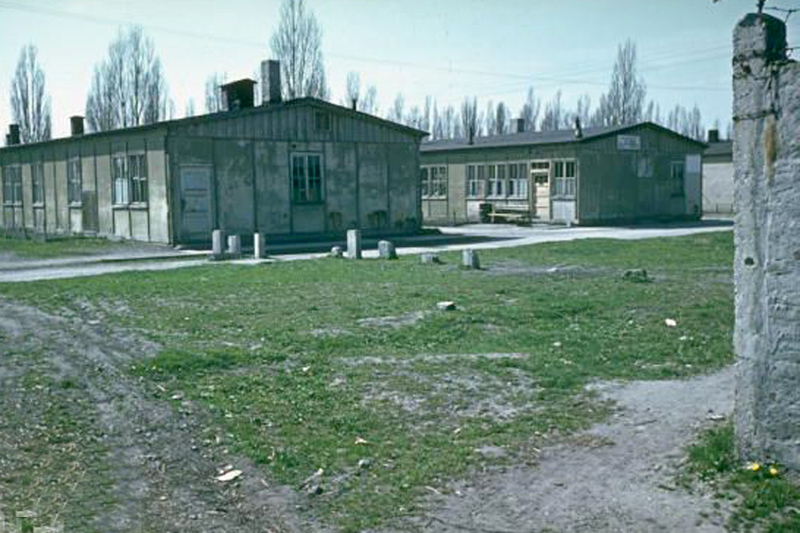 This is Dachau concentration camp. Because of their weak physical condition they could not withstand the long journey back to Norway at that point. 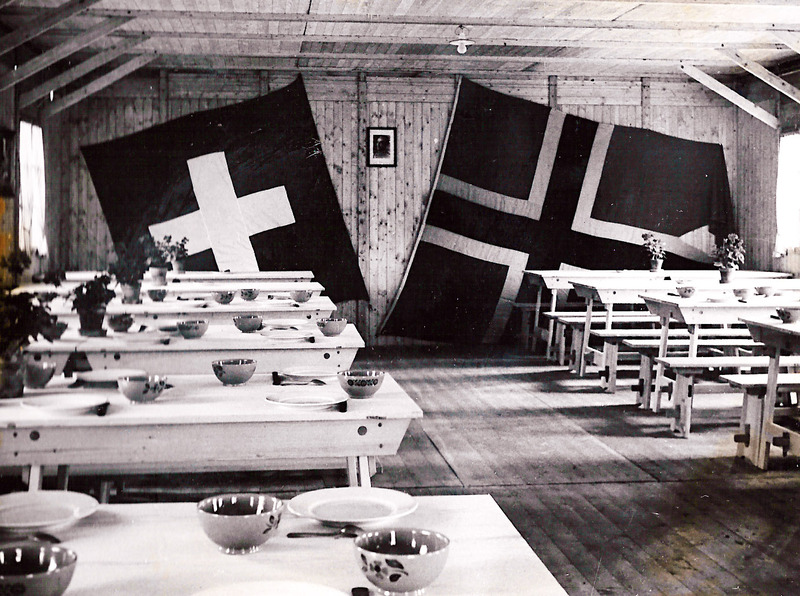 The Swiss town of Schaffhausen built a camp for the ex-prisoners and invited them all to come there to recuperate. Red Cross buses came to collect them on May 31st 1945, and they spent two-three weeks in quarantine. It was like arriving in Heaven!! Quarantine and mealtime in Switzerland. Once the quarantine was over they were free to roam, and had a wonderful time. Torbjoern talks about going into a restaurant and order coffee and cream cakes. They wanted to pay, but the waiter said -“Oh, no, the ladies over at the next table paid already”. That’s the way it was all the time; they were treated like royalty. Trips to the most scenic places in Switzerland were arranged. There were dances and visits to private homes. The men began to regain their health and weight too! 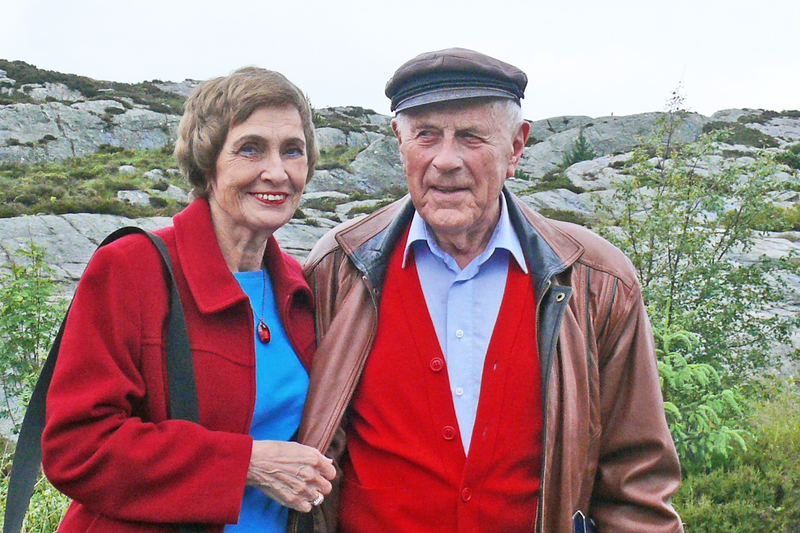 By August they were fit enough to return back to Norway and their families.